Don't rat us out to the paleo police #BecauseBacon. 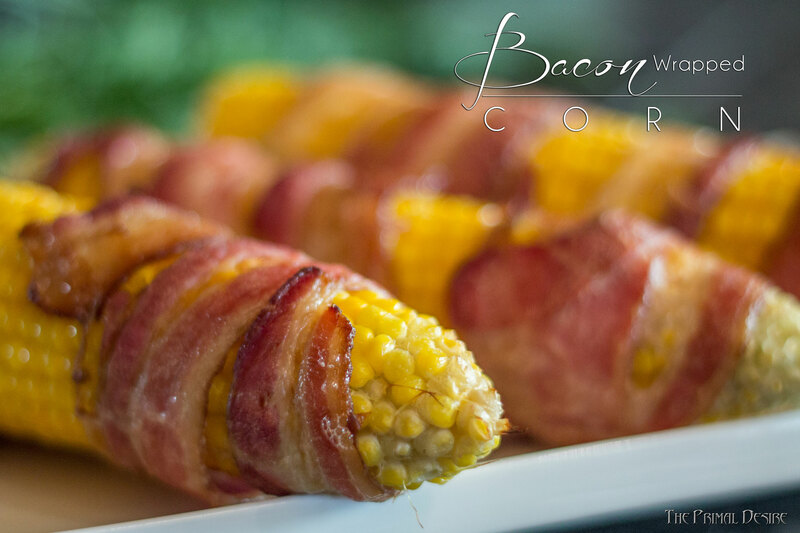 Smokey bacon wrapped around sweet fresh corn is the perfect balance of sweet and salty. 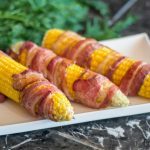 Maple bacon corn on the cob isn't paleo, but delicious real food! Sometimes I don't eat paleo, or gluten free. 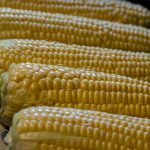 With no official allergies, the focus is on real, whole food, and sometimes that includes sweet fresh local corn on the cob! YUM! Life is all about balance, finding that sweet spot. The balance between responsibility and bliss, work and rest. I am working on finding balance in my life. I get consumed. Consumed by being busy, always having a task, a full schedule, a list of should do, and I haven't got anything left. I love what I do, I adore creating recipes, writing is cathartic for me, I am 100% behind Beautycounter and their mission and I love the products. I even love my day job! I have been responsible my whole life, and much of that has been self-imposed. I was responsible for my brother, my peers, at school, in the workplace. I started managing at 17 years old. For the majority of my 37 years, I have been responsible for other people. I am done. Last week I was traveling to a meeting listening to the CBC radio. I have been trying to use my travel time efficiently listening to podcasts, audiobooks, and talk radio. The CBC was talking about burnout in Yoga teachers and Chefs, people passionate about what they do, but just suffering without downtime. I started to cry, and I was nodding so hard it was a miracle I could still drive, and my Beautycounter mascara wasn't all over my face (it really is amazing). What I'm not telling you was that I was on my way to the first of 6 meetings scheduled that day (14th that week). Checking out or taking a vacation isn't an option, and I'm not sure how to move forward. I have been focusing on creating a schedule and scheduling in downtime. Meditate for 20 minutes every day. Schedule in 30 minutes of walking. Sleep for 8-10 hours every night. Have you ever felt burnt out? (Did you know that more than half of adults have at some point?) What did you do to make changes to your life? 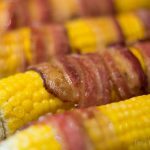 While I think about life changes I'll eat some delicious whole foods like maple bacon corn, and hope the paleo police don't roll up and bust me eating grains (JK – I don't care). Shuck and wash the corn. Lay the cob on a square piece of tinfoil, sprinkle with maple syrup and salt. Wrap the bacon diagonally attaching the ends to cover the length of the corn. Place diagonally and wrap with tinfoil. 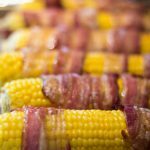 Repeat until all cobs are wrapped, place on a baking sheet and put in the oven for 45 minutes, turning once around the halfway point. 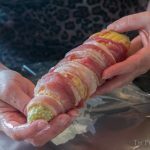 Pull them out of the oven and carefully unwrap, there will be steam, place back into the oven to crisp up the bacon for 15 minutes, turning once again at the halfway point. 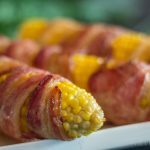 I’ve never wrapped bacon around corn on the cob before but it looks good and now I’ll have to try it! And yes to the burn out. I really need to make sure I get enough sleep because that helps with everything. So true! It is easier to cope with life and stress when you have had enough sleep. I’m scheduling my 8-10 hours!